Grandparents love to spoil and pamper their grandchildren. In their eyes grandchildren are perfect angels. Right now my daughter is getting pampered by my dad and my 3 fois (aunts). They have gone there for a week. They reached Bangalore yesterday and are already feeding all sorts of goodies to my daughter. She is enjoying all the attention. When I was growing up I really didn’t know my maternal grandparents that much as they were in India and I in Kenya. I met them occasionally when I was studying in Mt. Abu. I grew up in a joint family with grandparents, aunts, uncles, cousins, the works. My grandmother didn’t believe in pampering but I learnt a lot of things from her. My grandfather on the other hand loved pampering us. Making leftover roti ladoos, sharing his special recipe of jalebi and milk, doubling our savings on diwali day, giving us pocket money. I always remind my children that they are very lucky as they got to spend time with both sets of grandparents. What parents will not do for their children, grandparents will do for their grandchildren. When my kids use to come home from boarding school for holidays, my mother in law would spend hours in the kitchen making all sorts of goodies for them. My daughter will be going to Mumbai in a few days and I know my mother in law is already planning how to spoil her! Grandparents give unconditional love, patience, comfort, life lessons and kindness in abundance to their grandchildren. 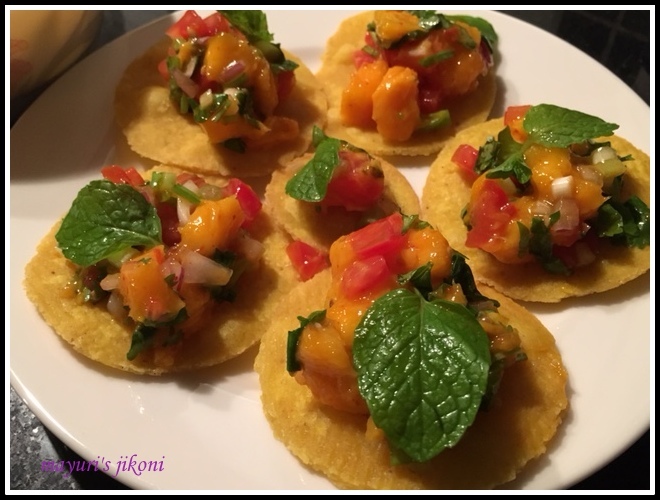 My recipe for today is home made nachos with mango salsa. Great as a starter or a snack and a cooling treat to beat the heat. You can prepare the nachos a few days ahead. Were you spoilt by your grandparents when you were growing up? Mix both the flours, cumin powder and salt in a bowl. Cover the dough with a cling film and let it rest for 30 minutes to 1 hour. Using plain flour for dusting, roll a part of the dough into a thin circle. Prick the rolled circle all over with a fork. Roast on the frying pan on both sides till light brown specks appear. Keep the cooked tortilla wrapped in a cloth or an airtight container. Repeat steps 6 to 9 with the remaining dough. Heat oil for deep frying in a wok, karai or deep pan over medium heat. Take one tortilla and cut small discs using a round cookie cutter. I used a 2½ ” cutter. Fry the small circles till they are crispy. Repeat steps 12 and 13 with the remaining tortillas. Store the nachos in an airtight container when they have cooled down. Mix all the ingredients for salsa in a bowl. Spoon about a tsp of the salsa onto the nachos and serve or keep both on the table and let the guests help themselves. If you are using white maize flour, add about ¼ tsp turmeric to get that lovely yellow colour if you want to. I fried the left over tortilla bits (after cutting the circles) also and used it up for my mexican bhel. You can roll the dough into a big square or rectangle and then cut it into squares. Adjust the spices for the salsa according to your taste. Make sure you roll the tortillas pretty thin like a chappati or roti. If it remains thick then its difficult to get crispy nachos. Can serve the salsa with store bought nachos. Anything with mango and corriander has to be yummy, nice looking snack! Delicious salsa, yes grandma's best. thanks for sharing with Favorite recipes event: christmas event, pinning.